Mark your calendars. Art starts Tuesday, July 14, 2015 with the opening of "Islands On The Edge" from 5 pm to 7 pm at the Atlantic Wharf Gallery located at 290 Congress Street. 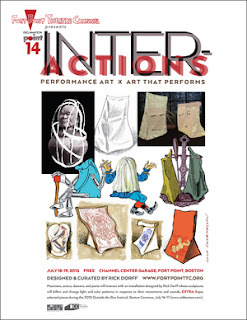 "Islands On The Edge" explores the Boston Harbor Islands and the concepts in the islands’ interpretive theme of isolation and existence on the "edge of society", through drawing, painting, photography, video, mixed media, and sculptural installations by twenty-one Fort Point Arts Community artists. More details. Be sure to see a truly unique performance when the Channel Center Garage opens its gates to INTER-ACTIONS, Performance Art X Art That Performs on Saturday, July 18th and Sunday, July 19th at 8 pm. Dozens of musicians and actors, poets and performance artists will collaborate with an inter-active art installation that billows and changes light and color patterns in response to their movements and sounds. These free performances are produced by the Fort Point Theatre Channel. Reminder: the comment deadline for Artists For Humanity Epicenter Expansion development is July 31, 2015.